Thirty-four years in preparation, 1999 Porsche 911 has evolved to the next level in the age-old pursuit of building the supreme sports car. 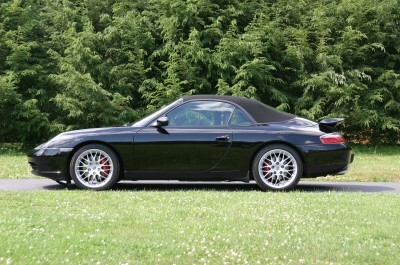 In 1999, the 911 underwent its first all-out “clean-sheet” redesign since its introduction in the mid-’60s. The new age 911 was slightly longer, wider and sleeker than any previous version. The all-new 911 is improved in every way over the last-generation supercar of the same numeric designation. Zero-to-60 in under five seconds. Top speed of 172 mph. The new design had to keep trademark 911 themes while becoming entirely different. The car’s profile, wheel arches and C-pillars hark back to the original design while creating a fresh new appearance. The 1999 911 is wider than the previous car to compensate for the widened track. It’s longer than the previous car, allowing for a more steeply raked windshield and better aerodynamics. The longer wheelbase that improves handling and traction while allowing engineers to design a more spacious interior. The Cabriolet features a top that opens or closes in 20 seconds. The Porche 911 is one of the best sports cars in the world.